Need Carbs Now! The 'Works' is Your Answer! We Rebuild/Rejet our own carbs, Not yours. Set them up per your needs/specifications. Ship them to you quickly while you keep riding. Add a $300 Core Charge, reimbursable when your old carbs are returned. We guarantee All CarbWorks Services for as long as you own your bike! Pair of our Rebuilt Carbs, Rejetted per your desired setup. New Diaphragms and Slides in both Carbs. Needle Jet Replacement with GMan's Custom Designed Needle Jets. Rejetting both carbs per your setup and elevation. You simply place your order and they will arrive shortly, then install and ride. Return your old carbs for up to $300 core charge reimbursement. while realizing 38-40 mpg based on your right wrist action! Procedure: Place your order, receive your Works Carbs and install. 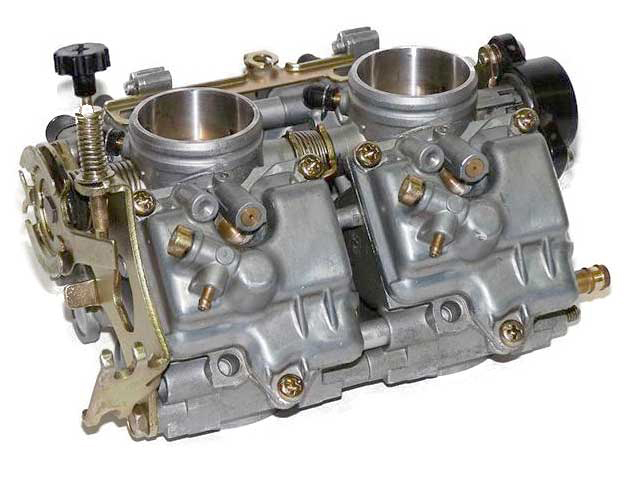 Remove your old carbs - leaving them bolted together, drain all fuel, seal in 1 gallon Zip-Lock bag, add generous amounts of packing in box and mail via United States Postal Service (USPS) Priority Mail Flat Rate adding $500 of insurance for security. When they arrive we will inspect and issue a core charge refund of up to $300 based on their condition. We guarantee all CarbWorks Services for as long as you own your bike. All you do is pay shipping each way and we verify and reset all, guaranteed. "Bike runs better than ever!" Review: I ordered "The Works" carbs, they were set up and delivered on time, after installation my bike ran better than ever! If you need a set of carburetors for your intruder 1500 I'd recommend getting them here! The customer service is above and beyond! Thank you very much for that as well! Review: All I can say is what a difference. GMan did the Whole 9 yards on my carbs. I installed them back on the bike today and took it on a 100 mile trip. We bought the bike new in 1998 and it has never ran this good.Thanks GMan from Herb and Sylvia in Kingman, Arizona. Review: The bike runs like a Dream! And the shipping worked perfect. Just mount and ride. A Big Big thank you GMan. "more power and better gas mileage"
Review: My name is Stephen Hales and I live in Fayetteville,N.C. I got my carbs in last THURSDAY. Right after putting them in took a test drive to the beach and back about 160 miles . Plenty of power and 40 mpg. Next day I took a trip to the mountains for couple days. Still got 40 mpg and PLENTY of power. That's about 1000 miles in 4 days. GMAN's carb work and the K&N air filter has worked magic on my bike. THANKS .